From Earshot Jazz: In tribute to Brad Inserra, who gave bassist Michael Bisio his first solo bass gig, Bisio performs duets at the beloved Brad’s Swingside Cafe, in Fremont, for five nights, beginning January 30. January 30 & 31, Bisio performs with the incredible Joe McPhee, world renown multi-instrumentalist, at the forefront of the improvised avant-garde since the late 60s and one of Bisio’s greatest influences. Additional nights feature, February 1, a rare appearance by tenor great Gary Hammon; February 2, tenor saxophonist Brian Kent; February 3, the incomparable Artis the Spoonman. Admission is $7 and reservations are highly recommended, at 206-633-4057. The title “Cry & Roar” is a tribute to the memory of baritone saxophonist Andrew Carrico, a regular Racer Sessions participant who died tragically in September of 2012. The loss of Andrew’s life occurred not long after the shooting at Cafe Racer that previous summer; another wound for an already enormously grief-stricken community. Utterly unique and self-aware, Andrew once described his sound on the saxophone as a cross between a cry and a roar. For 5 years Table & Chairs and Racer Sessions have provided one-of-a-kind artists like Andrew a platform to freely express themselves. “Cry & Roar” is dedicated to this ever-expanding community. In recognition of Martin Luther King, Jr. Day, which is traditionally observed as a day of service, Earshot Jazz will hold a FOOD Drive in the PONCHO Concert Hall lobby. Attendees are encouraged to bring a non-perishable canned or boxed food item, and will receive a $5 discount on admission. On Sunday, January 25, at PONCHO Concert Hall at Cornish College of the Arts tenor saxophonist Ben Wendel brings his new quartet to Seattle which includes some of the most exciting younger artists today—a startling demonstration of exactly why jazz is alive and thriving right now. Pianist Taylor Eigsti, bassist Harish Raghavan, and drummer Eric Harland join Wendel. Though all of the members of this quartet perform and record with each other regularly, this will be their first tour as a quartet. On Sunday, February 8, at PONCHO Concert Hall the trio Thumbscrew, a band consisting of three well-established leaders on the new jazz/new music scene, present new music created specifically for this ensemble. The “three-composer trio” includes Mary Halvorson on guitar, Michael Formanek on double bass, and Tomas Fujiwara drums. Tickets are available through Brown Paper Tickets or 1-800-838-3006. General Adult tickets are $16 for FOOD, $18 for Ben Wendel Quartet, and $16 for Thumbscrew. Half-price tickets are available for students, veterans, and active military, and $2 discounts are available for Earshot members and senior citizens (60+). For more information, contact Earshot Jazz at 206-547-6763 or go online at www.earshot.org. A hard-swinging piano trio led by Danny Kolke will be featured in highlights from this month’s Art of Jazz concert at the Seattle Art Museum airing at 2 PM Sunday, January 18 on 88.5 KPLU and streaming at kplu.org. The concert broadcast includes standards, spirituals and blues by the trio which includes Danny Kolke, piano, Jon Hamar, bass and Greg Williamson on drums. The trio plays regularly on Sunday evenings at Boxley’s in North Bend and has recorded two CDs live at the club and issued on Pony Boy Records. 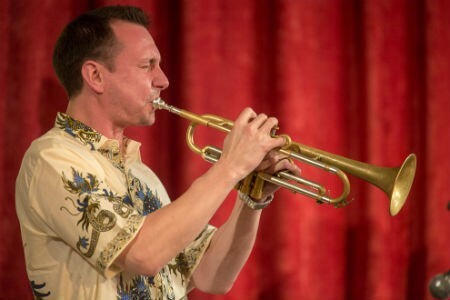 Danny Kolke is also the manager of Boxley’s, a family-friendly restaurant which features live jazz seven nights a week. Student musicians get a chance to try the stage on Monday, Tuesday and Wednesday and the pros play Thursday through Sunday. Danny’s a father of three young musicians himself, and is a volunteer teacher of a jazz band at Mt.Si High School. Jazz Northwest is recorded and produced by Jim Wilke exclusively for 88.5 KPLU. The program airs Sundays at 2 PM Pacific and streams at kplu.org. Jazz Northwest is also available as a podcast at jazznw.org following the broadcast. 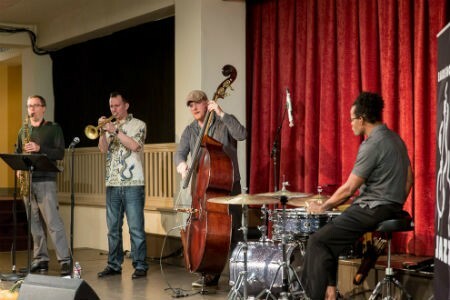 The Art of Jazz series is presented by Earshot Jazz and coordinated by John Gilbreath in cooperation with the Seattle Art Museum, with support from KPLU. The next concert in the series will feature singer Eugenie Jones on February 12 at 5:30 pm. The concerts on the second Thursday of each month are free and open to the public at SAM. BOXLEY’S: The Tiptons Sax Quartet: Special Guests! We are catching up with posting photos from the Earshot Jazz Festival. 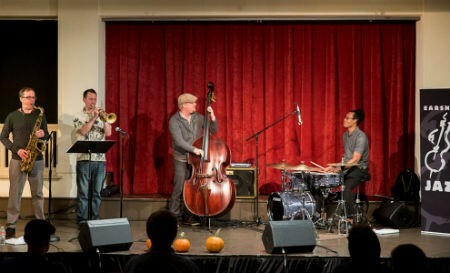 Here are some photos of The Spin Quartet (featuring former Seattle resident Chad McCullough) performing at Town Hall via EyeShot Jazz. 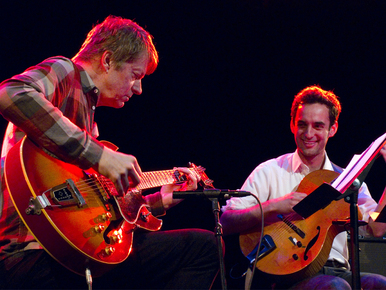 Two of the most creative guitarists in jazz, from two generations, team up for an open-ended romp at the Royal Room on Tuesday: Veteran Nels Cline, 58, a polymath familiar to broad audiences from his work with Wilco, Thurston Moore and Scott Amendola; and Julian Lage, the 27-year-old phenom introduced a few years back by vibist Gary Burton. The pair recently released the aptly titled “Room,” a string of free-ish improvisations that leave lots of space between the lines, including the conspiratorial “Whispers From Eve,” reverb-laden “Freesia/The Bond” and sitar-inspired “Calder.” Though the album overall feels a bit precious and abstract, odds are these guys will be more lively on stage than in the studio. 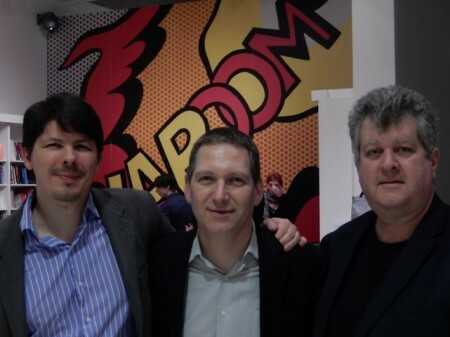 Besides, my colleagues in the monthly Down Beat magazine feature, The Hot Box, all disagreed with me. Album ratings aside, I’ll definitely be checking these guys out live, and so should you. 7 and 9 p.m. Tuesday, Jan. 13, at the Royal Room, Seattle; $20. Nine recent and forthcoming jazz CDs will be sampled on Jazz Northwest on Sunday, January 11 at 2 PM Pacific on 88.5 KPLU. Among them is a name that will be familiar to longtime followers of the Seattle Jazz scene, Gene Argel. Originally from Tacoma, he played both organ and piano up and down the West Coast before finally settling on the island of Maui where he’s lived and worked since 1982. He still visits Seattle periodically and over the last three years has recorded material for his debut release (!) titled Luminescent. Joining pianist Gene Argel on the new Origin release are long time friends Jay Thomas, Chuck Deardorf and Mark Ivester. Among other new releases on this program are CDs by Thomas Marriott, Marc Seales, Bryan Smith, George Colligan, Oliver Gannon and Wayne Horvitz representing a range of styles by musicians from Portland to Vancouver BC. Jazz Northwest is recorded and produced by Jim Wilke exclusively for 88.5 KPLU The program airs Sundays at 2 pm Pacific and streams at kplu.org. The program is also available as a podcast at jazznw.org following the broadcast. For those in Seattle who know pianist Mike LeDonne, check out today’s article in the New York Times.